H. (a student who asked not to be named or photographed) woke up in a shelter surrounded by kids just released from a juvenile detention center. Like her, they sat in the stark building in a tiny Oregon coastal town, with no parents present. Like her, some of them had just started high school, barely 14 years old. That’s where the similarities ended. When the slim, athletic, straight-A student had returned home from school the previous day, her mother had attacked her in an all-too-familiar rage. This time, H. fled to a friend’s house, and the friend’s parents called the police. Concerned teachers had already filed reports, suspecting parental neglect and abuse; now, authorities removed her to the only open bed they could find—in the detention center with young people in trouble for theft and drugs and violence—before relocating her to a foster home. She learned to navigate financial paperwork, to apply for scholarships and loans. She attended the UO’s summer orientation program for new students and resigned herself to massive postcollege debt. Then, assistance arrived. During H.’s sophomore year at college, financial aid employees told her about a new fee-and-tuition waiver pushed through state legislation by a group of savvy and determined young adults—people who’d grown up in foster care, just like her. The Foster Youth Tuition and Fee Waiver (House Bill 3471) went into effect for the 2012–13 school year, and serves students legally removed from their biological parents. Teens who have spent at least 180 days in foster care after age 14 can access the waiver, which, combined with other grants and subsidies, enables undergraduates without parental support to attend in-state community colleges and universities. In return, they volunteer on campus and in the community in positions ranging from Sunday school teacher to student government executive to senior mentor for incoming freshmen just out of foster care. The student who expanded Eyster’s view was Jamie Hinsz, BA ’11. Now a policy specialist for Foster Club Inc.—a national network that serves young people in foster care—she learned to work with the state legislature while still an undergraduate, earning degrees in political science and public policy at the UO. In 2007, she and several other young people began work to legalize a tuition-and-fee waiver for former foster kids living in Oregon. Hinsz attended classes, then drove to Salem for discussions with legislators, returning home to Eugene in the evenings for work and homework. “You didn’t know if you needed to testify in an hour,” she says. “A couple of times, we spent the night in the car in the parking lot of the capitol building in case we needed to run in.” She and colleagues researched cost analyses and visited legislators’ home offices to explain to them that foster youth are an invisible population who benefit from a postsecondary degree. The main points of their argument: Educated people vote more, they’re more civic-minded, and they’re less of a burden on the state. Kids in foster care who find themselves out on their own after their 18th birthdays without going to college are more likely to face unemployment, poverty, and incarceration. This is what Hinsz and colleagues in their teens and early 20s attempted to convey at a senator’s home office one day. They explained what it was like to survive physical and emotional trauma from biological parents, and described the sadness and discomfort of growing up in a foster home . . . or several. While the legislation does waive tuition and fees, students still need to pay for books, housing, food, and other living expenses. Most achieve this through a combination of other grants, scholarships, loans, and employment. Many, as Hinsz did, hold down one or two jobs while maintaining a full load of classes. The term “aging out,” familiar to anyone involved in foster care, refers to life after age 18. Young people who haven’t found a permanent adoptive home may find themselves without health care or a place to live. Some become homeless. Some find employment and exist below the poverty line. A few attend college. Maxwell T. (last name omitted by request) was one of the lucky ones. He got to stay with his foster mother during his first term at the UO. She helped him purchase a backpack and school supplies. Then, he moved out of her house. Once out on his own, he developed depression and PTSD. He also began work as a youth leader for Oregon Foster Youth Connection, an advocacy group made up of current and former foster youth between 14 and 25 years old. Members of the group were instrumental in getting the tuition and fee waiver signed into Oregon state law in 2012. Both Lavenditti and Hinsz note that other states have been implementing a similar waiver for years. The University of Alaska, in conjunction with the Office of Children’s Services, offers tuition waivers annually to 12 full-time students who maintain good academic and code-of-conduct standing. Washington has the Passport to College Promise Scholarship Program, which provides former foster kids enrolled at least half-time with financial aid, services such as a technology library, where students may borrow laptop computers, and supplies with which to set up their dormitory room. None of the students involved in getting the bill passed could use the waiver; they’d already graduated from college by the time it went into effect. But their work empowered and inspired current students to testify in favor of the Oregon Foster Children’s Bill of Rights, 2013 legislation requiring the Department of Human Services to hire a state foster youth ombudsman, and educate those in foster care about the rights they have under state law. “We’re foster youth taking care of each other,” Hinsz says. Maxwell T. used the tuition-and-fee waiver during his first two years at the UO—years marked by mental health issues, academic challenges, and a powerful desire to succeed as an animator. Slight and red-haired, often toting his serene black cat Kitsch in a quilted pet carrier, he describes a childhood full of sexual abuse and neglect. “We had no vaccinations, no medicine,” he says of his family, who moved from Arizona to Holland to Oregon. In high school, a girlfriend urged him to talk with a counselor, saying that his family wasn’t behaving normally. “I spoke with a mandatory reporter,” T. remembers, referring to an adult required by law to report to Child Protective Services a minor’s disclosure of abuse. That day after school, administrators told him to go to the principal’s office. T. walked into a room and found himself face to face with police officers. Instantly, he began to deny what he’d told the counselor, terrified that his parents would come to school and confront him. They didn’t. Instead, T. found himself living with a foster father and mother, expected to be a role model for four young girls in his new home. “I wasn’t in any position to do that,” he says. Still, he grew attached to his foster parents, and when his caseworker—after six months—told him the placement was only temporary, he wept. Hinsz says that at the UO, 18 students have received a total of $30,867 in tuition-and-fee waivers since 2012. When T. learned about the aid available to him, he recalled his father’s love of anime and his own discovery of the Japanese-French animated film Interstella 5555, inspired by an album by the band Daft Punk. Now, he’s a junior in the Digital Arts Program. Though he’s estranged from his father, he spends holidays with his mother and stepfather, who have begun to contribute financially to his education. 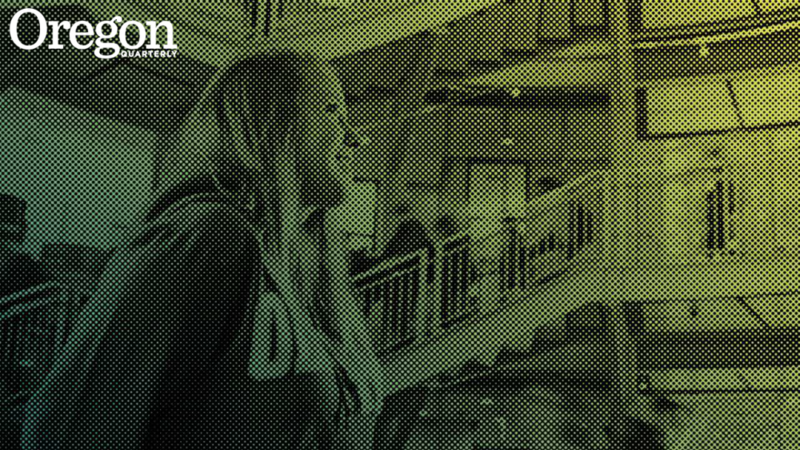 Kindred, Class of 2015, serves as external vice president of the Associated Students of the University of Oregon (ASUO) on campus. He moves fast, a blur in a green hooded sweatshirt and black sweatpants, short dreadlocks bouncing as he strides across campus. A philosophy major pledged to Alpha Phi Alpha Fraternity, he also volunteers for Oregon Foster Youth Connection. At four years old, Kindred’s mother took him, along with his older brother and sister, to Northern California for a family barbecue. Midway through the celebration, his mother approached him. “I’m going out to another party,” she told him. Kindred credits his Independent Living Program mentor—with him for 14 years—for much of his success. Despite financial and emotional challenges, he balanced high school academics with success in football, track, and baseball. 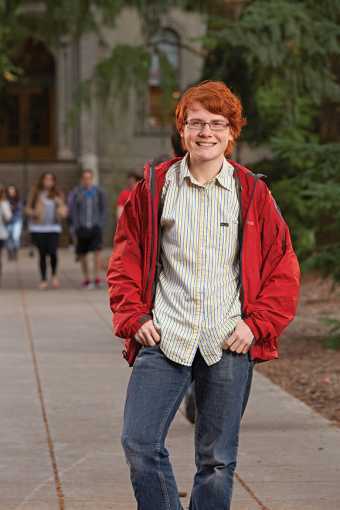 During his first four years of college, he received funding from Pathway Oregon, which waives tuition and fees for Federal Pell Grant–eligible recent high school graduates with a 3.40 or higher GPA. He also took out loans—$34,000—to supplement financial aid and wages from his work as a customer service representative at a rental car company. Ordinarily, he enrolled in summer classes on his dime. 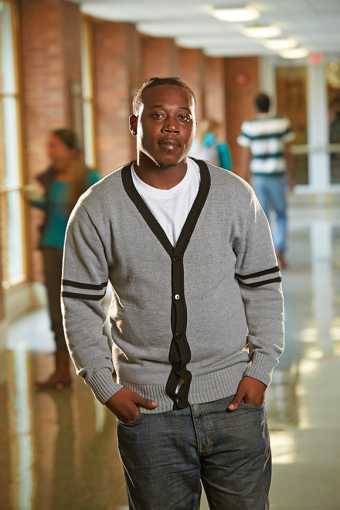 Last year, as a fifth-year senior, he was able to use the foster youth tuition-and-fee waiver. “That was the first summer I didn’t have to struggle,” Kindred says. Students who use the tuition-and-fee waiver are required to volunteer 30 hours a year on campus or in the community. Eyster, as associate dean of students, oversees their community service and asks them each to fill out a six-page stapled notebook in which they identify goals they’re hoping to achieve as volunteers, aspects of the experience that prove frustrating or rewarding, and those at the service site who might offer them additional support. Maxwell T. has volunteered at the Survival Center—a campus resource center focused on social and environmental justice—as well as at the Mount Pisgah Arboretum Wildflower Festival. H. works with junior high and high school students at the University Fellowship Church. She’s also working with Eyster on developing a mentorship program for incoming foster youth at the UO. On a Friday afternoon in mid October, three Track Town pizzas and four bottles of soda stood untouched in a campus conference room. Around tables arranged in a large square, 10 campus and community employees ranging from academic advisors and financial aid administrators to multicultural inclusion support specialists sat and waited for former foster youth to appear. Rather than abandon their efforts, however, the group in the conference room began to talk about how to best serve these students. The state may be a generous parent, but it can have trouble communicating its good intentions to a population that continues to remain largely invisible. Maybe it’s possible to identify them at IntroDUCKtion, someone suggested, or during Week of Welcome. Someone else pointed out that, ideally, students feel most empowered if allowed to identify, or not identify, themselves as coming from foster care. Maybe informational tables at Looking Glass Youth and Family Services would be beneficial, someone suggested, since the independent living coordinator there works with former foster kids transitioning into the UO. Some may have a relationship with their biological parents, she explained. Others might maintain contact with their foster parents. Some are proud of surviving their childhood challenges, and some want to put the past behind them. Melissa Hart is an adjunct instructor in the University of Oregon School of Journalism and Communication and the author of Wild Within: How Rescuing Owls Inspired a Family (Lyons, 2014).